IT’S OFFICIAL! U-Jam Fitness is spreading the LOVE and UNITY in West Hollywood starting FRIDAY, OCTOBER 17th at 7:30PM. Mark your calendars, download a FREE GUEST PASS at 24 Hour Fitness’ website by clicking HERE. Let’s break in this new spot together and get your FRIDAY NIGHT groove on! The Group X Floor will be on and poppin’ with world beats and urban flavor! Come experience an athletic cardio dance workout LIKE NO OTHER! 8612 Santa Monica Blvd., West Hollywood, CA! Lace up your kicks and LET THE MUSIC DRIVE YOU! 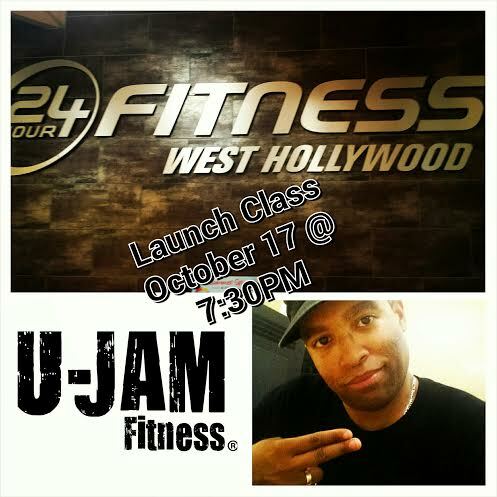 Join Jerod Williams as he debuts U-Jam Fitness at 24 Hour Fitness in West Hollywood, CA on Friday starting October 17th at 7:30PM. Why wait in line at the club on the strip when you can GET IT IN on the Group X Dance Floor!